Park City, Utah home and condominium prices in general are still rising, but a few things have had me scratching my head recently. I study the data on the Wasatch Back (formerly Park City) Multiple Listing Service (MLS) daily. I watch the new listings, pended sales, completed sales, removed listings and price changes depending on the day of the week, there are 35-75 daily changes. Price Changes can really give an idea of which way the market is trending although in some cases they make me wonder what was that agent or owner thinking? when they priced it originally. Recently I sent a new listing to a client with a note stating, this is priced well and likely wont last long. Two weeks later it still hadnt sold which made me question my knowledge, but then a price increase on the property showed up with the price going UP by nearly 35%. I somewhat wrote this off to an agent with little experience in our market, but I noticed something similar from a seasoned agent that knows our Park City real estate market well. This time it was a 20% price increase, but both properties remain on the market a few weeks later waiting for offers on their increased prices. Maybe we can chalk it up to greedy Sellers(?). While price increases on listed Park City properties are fairly rare outside of new construction which often sees pricing go up as the projects are closer to complete, price reductions are common. Owners may like to test the market with a high initial price only to lower it after a few weeks. Lately though it has not been uncommon to see prices be lowered by 20% or more. Seeing a $500,000 drop on the price of a home is surely a good talking point, but Im not convinced that it is a great marketing strategy. Buyers will tend to not even look at a property that is too far above the market and Sellers often get anchored to their original price whether or not it was realistic. The Park City real estate market has a lot of moving parts and inventory can be quite slim depending on what exactly you have to sell or are looking to buy. Properties that are priced well move quickly, but it doesnt mean that you can get or need to pay 20% more than the market value. Posted in buyers, sellers, market statistics | 0 Responses to "Making Sense of Park City, UT Housing Prices"
The Park City, UT real estate market continued its strong trends for 2015 with the highest quarterly sales for the year and the third highest quarterly sales volume (unit sales) since 2006. As per the YouInParkCity.com norm we look only at home and condominium sales in the Greater Park City Area (Park City and Deer Valley, the Snyderville Basin and the Jordanelle Reservoir Area. There were 145 Single Family Home sales in the Greater Park City area during the third quarter of 2015. This number was down slightly from the same time in 2014 by approximately 10%. Conversely the median sales price jumped by $105,000 to reach $955,000. Sales of homes under $500k have almost completely vanished as there were seven such sales in the past quarter while the same period last year had twenty. At the time of this writing there were two available homes listed for under $500K. At the other end of the spectrum, there were thirty five sales for more than $2M the same period last year had only nineteen. The current inventory of homes listed for over $2M is over two hundred. Condominium Sales for the third quarter saw a large jump versus the third quarter of 2014 with 227 sales versus 193 during 2014. The median price stayed about the same as last year at $421K. A large portion of the bump in sales volume can be attributed to the completion of the Newpark Terrace development with forty sales recorded. With the exception of Newpark Terrace, condominium sales in Park City were spread evenly among developments. 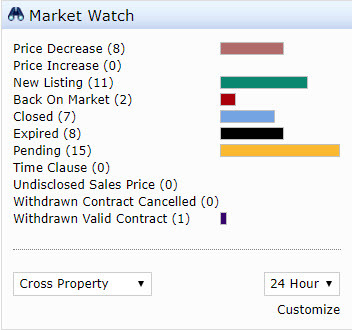 Once again sales are happening very quickly with 38% of the recorded sales being on the market for less than two weeks. This is more significant for homes and condominiums under the median sales price. With fewer options on the market, Buyers need to quick to react to new listings. Scarcity is a driving factor for Park City real estate; our focus in this report is Park City area homes and condominiums. Areas immediately outside Park City make up 25% of the sales across the Park City MLS system. The Kamas and Heber Valleys as well as Wanship & Coalville areas can provide viable alternatives to Park City with more property inventory and less scarcity. For assistance in marketing your property for sale or finding a property to purchase contact a realty professional with the YouInParkCity.com group at KW Park City Keller Williams Real Estate (435)962-9472. Data herein was compiled from the Park City Board of Realtors MLS System. Information is deemed reliable, but not guaranteed. Posted in market statistics | 0 Responses to "Park City Real Estate Sales 2015 Q3"
Whether you are a Buyer or a Seller in the Park City Real Estate market, the price point that you are buying or selling in can have dramatic impacts on how easy or hard the process is. The Park City Real Estate Market has seen its strongest 12 month period for sales since 2006. Inventories are low and prices in many areas are above their historic peaks. With that said it does not mean that there are no deals to be found or that the property you list for sale will be gone in a matter of days. There are many factors that make up the ultimate value of a home or condominium in Park City and of course location is the most important; the age, shape, layout, views and design also contribute to the value. Once all of the of the value factors of a home are considered, the ultimate price has an impact on what competitive part of the market you are buying or selling in. A look at the past years sales, current under contracts, and active inventory in the Park City Real Estate Market homes and condominiums provides a lot of insight to the competition levels at different price points. The Park City MLS recorded 844 condominium sales over the past 12 months and there are 395 currently listed for sale which gives us about 5.5 months of inventory at the past 12 months sales rate. This absorption rate though is dramatically different depending on the price range you are searching. For condominiums under $500K, that supply drops to months and increases to 20 months for condominiums listed for sale at over $1 million. Single family homes in the Park City real estate market show similarities: the current 388 homes listed for sale would be gone in 8.4 months at the past 12 months sales rate, but when broken down into price points a different storyline appears. The inventory of homes priced under $1M would last only 3.7 months at the current absorption rate while homes priced over $2M have an inventory that would last nearly 2 years (23.2 months) at the sales rate of the past 12 months. Lower priced homes and condominiums are more competitive on the Buying side while higher priced homes and condos have more competition when it comes to Selling. To truly understand the implications of this we need to delve further into specifics of a Buyer or Sellers individual property types, subdivision, state of repair and of course location. For a professional assessment and action plan for your Park City Real Estate needs contact a realty professional with the YouInParkCity.com Group of KW Park City Keller Williams Real Estate. Posted in buyers, Park City Economy, sellers | 0 Responses to "Park City Real Estate Competition by Price Point"
Golf in and around Park City, UT is near and dear to the YouInParkCity.com group so with the days getting longer and the golf season fast approaching; it is time to take a look at the past 12 months in the five amazing private City golf communities. The communities of Glenwild, Promontory, Red Ledges, Tuhaye and Victory Ranch are home to some of the top courses in the state; all of the courses have received national recognition. Which course ranks where is a matter of opinion but in terms of layout and condition they are all exceptional. The courses are all relatively young and are only improving. In the past 12 months there have been 149 sales plus 35 pending sales in Glenwild, Promontory, Red Ledges, Tuhaye and Victory Ranch combined. This number includes vacant land, single family homes and condos. For the same time a year ago total sales were 127 properties. Both years had approximately two dozen distressed sales. Current distressed inventory makes up less than 5% of the current available inventory. The more than 15% rise in sales has been accompanied by an increase in prices with the average selling price of vacant lots up by nearly 30%. Market indicators for Park City area real estate are very strong and this bodes well for the private golf course communities in Park City as well. 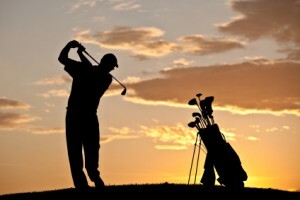 In the next few weeks we here at YouInParkCity.com will break down the real estate sales for the past year and review the upcoming and ongoing improvements being made at each of the five private golf course communities in the area. All of the local Park City area public golf courses are already open and the private courses will be open by Memorial Day. 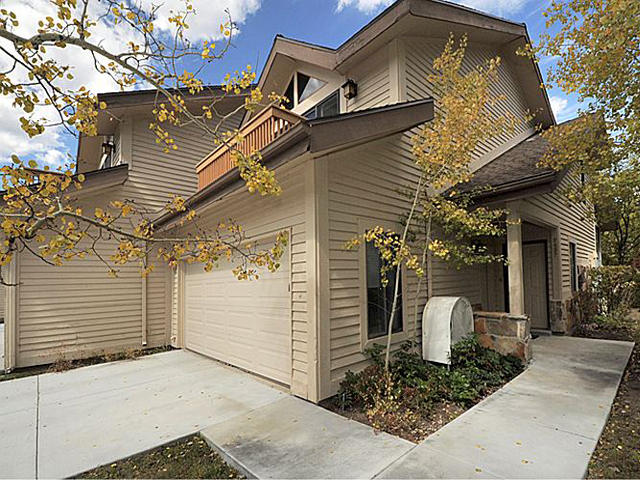 For specifics on a particular golf course community homes in Park City, UT contact the YouInParkCity.com Group at (888)968-4672. Posted in buyers, Park City Golfing, Park City Real Estate Notes, sellers | 0 Responses to "Park City Private Golf Community Udpate"
The third quarter of 2012 has slipped by and fall is in the air in Park City, Utah. Real estate sales for the area are changing focus a bit from single family residential to vacation second homes and condominiums more focused toward winter sports. Year versus year sales data for Park City real estate shows a market gaining strength. Single family home sales so far for the year are up 6% versus the first three quarters of 2011 and condominium sales in Park City have seen a 10% increase. Sales comparisons for the most recent quarter show condominium sales rising quickly in Park City. Sales of condominiums for the third quarter were up by nearly 25% from the same time period last year. This increase represents nearly the total difference in sales when comparing the quarters. A large portion of this was a bulk sale at the Newpark Hotel. When excluding this bulk sale, sales were still up by over 10%. Also of note in Park City condominium sales is the fact that the median price of the condominiums sold is that the median sales price was up over 10%. The median sales price of $315,000 ($340,000 excluding the bulk sale) would indicate that over half of the sales are condominiums that would be classified as vacation rentals. Single family home sales by contrast have seen a decline in their median sales price ($705,000 in Q-3 of 2012 versus $750,000 for Q-3 of 2011). The impact of distressed sales fell again this past quarter with only 25 sales that were bank owned properties. This was down from 38 for the same quarter last year; a 35% decrease. Competition in purchasing bank owned homes and condominiums in Park City continues to be fierce; most experience multiple offers, sales prices above asking price and almost all end in a cash purchase sales. Real estate sales in Park City, UT are location specific and many factors specific to location should be considered when determining which area or subdivision is best for you. Contact a Park City realty professional with YouInParkCity.com at (888)968-4672 for more information. This data has been derived from sales statistics as posted on the Park City Board of Realtors MLS using only statistics involving single family homes, condominiums, and vacant land in the greater Park City areas (1-23). Data is considered accurate, but not guaranteed. Posted in buyers, Park City Real Estate Notes, Park City value, sellers | 0 Responses to "Park City Real Estate Sales and Info Q-3 2012"
The Park City, UT housing market is often thought of as being different than the rest of the country due to its luxury resort nature, but many of the indicators housing experts are pointing to in the rest of the country are mirrored closely here in Park City. A Wall Street Journal article today titled Housing Ends Slide but Faces a Long Bottom notes gains being made in the construction of new homes in the US Market. Locally in Park City, construction of new homes has yet to rebound, but the combination of lower building lot prices and construction costs has many Buyers weighing new-builds versus purchasing previously owned homes. This trend is even more prevalent in the outlying areas of Park City such as Midway, Heber and Kamas where new home offerings can be found for less than $100 per square foot. Shadow inventory, tenuous job growth and the likelihood of mortgage rates rising in the future are cited as possible stumbling blocks to the recovery, but the overall tone of the article is positive and while it doesnt suggest a rebound in pricing, it does see the market at or near the bottom. An article also from the Wall Street Journal Friday April 27 entitled Stunned Home Buyers Find the Bidding Wars Are Back notes that the current lack of supply in the housing market has people offering prices above list for homes in some parts of the country. The article notes that at the height of the housing crisis in 2008 inventory was at an 11.1 months supply and that number currently is 6.3 nationally. That represents a 40+% reduction; Park City real saw a peak of nearly 3600 listed properties and now has just 2100 listed across the MLS also a 40% reduction in inventory. Multiple offers and prices being bid up are common with bank REO properties and it is also seen in any aggressively priced property. The prices are not coming near peak levels, and Park City buyers are well in tune with what is a good deal; buyers are aggressively pursuing these deals. While the Park City real estate market has seen a drop in inventory, the drop in inventory and changes in price have not been equal across all areas of town or all price points. For a report specific to the Park City neighborhood or home value that interests you most contact a realty professional with YouInPakCity.com at (888)968-4672. Posted in buyers, Park City Economy, Park City value, sellers | 0 Responses to "Park City Housing Bottom (?)" The bottom of a market be it stock prices, commodities or real estate in Park City, Utah can really only be seen in hindsight. We can never be sure of the bottom until we look at it in retrospect and study the sales data. While we cannot yet call the bottom of Park City real estate prices, we can see definitive signs of the bottom. 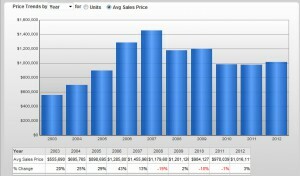 Real estate sales in the second quarter of 2011 show a strong increase in the number of transactions. The 451 closed real estate sales in Park City for the second represent a 20% increase from the first quarter of 2011 and the best quarter since the fourth quarter of 2007. The recent increase in sales in the area has been accompanied by a decrease in the number of newly listed properties in the Park City real estate market. So while demand is increasing, the supply is falling which should in time lead to an increase in pricing. While it may be too early to call the bottom of the market in terms of pricing, we may be seeing signs that some of the best deals are gone. It is kind of like that big sale at the store and we are in its last days. There are still good values to be found in the Park City real estate market, but there is far less to choose from. A good example of this may be the Promontory area of Park City: so far this year there have been 15 homes sold for under $1.5M that were not part of the "cabin" communities and only 10 remain in this price range. It doesn't mean that there are no more deals to be had in the area, only that the remaining opportunities have been picked over. There are other areas within Park City that show real estate values possibly finding their bottom as well as localized areas which have indicators pointing toward further price reductions. For information on specific buying and selling opportunities in Park City real estate contact a realty professional with YouInParkCity.com. Posted in buyers, Park City Economy, Park City value, sellers | 0 Responses to "Did You Miss the Bottom?" More than just the skiing, biking, golf, snowboarding, hiking or ...it is the community and local amenities that make Park City Real Estate Valuable. Ask a local why they live in Park City, UT and many will answer that they came here for a winter and never left. In this ongoing blog chapter we will talk about some of the many things that make Park City, Utah a special place to live and own real estate. Today's topic: The Park City Farmers Market Every Wednesday throughout the summer, there is a local Park City Farmers Market held in the lower parking lot of The Canyons Resort. The weekly event is held rain or shine. It is one of those great spots around town where you are bound to run into friends. Stop by and grab lunch, along with some fresh produce, local raised beef and lamb, fresh fish, bread, cheese, flowers and more. The Wednesday Park City Farmers Market is a great stop for food and snacks on your way to the free concert at Deer Valley too. The market is also home to some local artisans featuring sculptures, art, jewelry, antiques and more. The Wednesday Market has been the inspiration for a few other indoor and outdoor markets around Park City and it is still one of the best. For more information about the Park City Farmers Market, go to: http://www.parkcityfarmersmarket.com/. 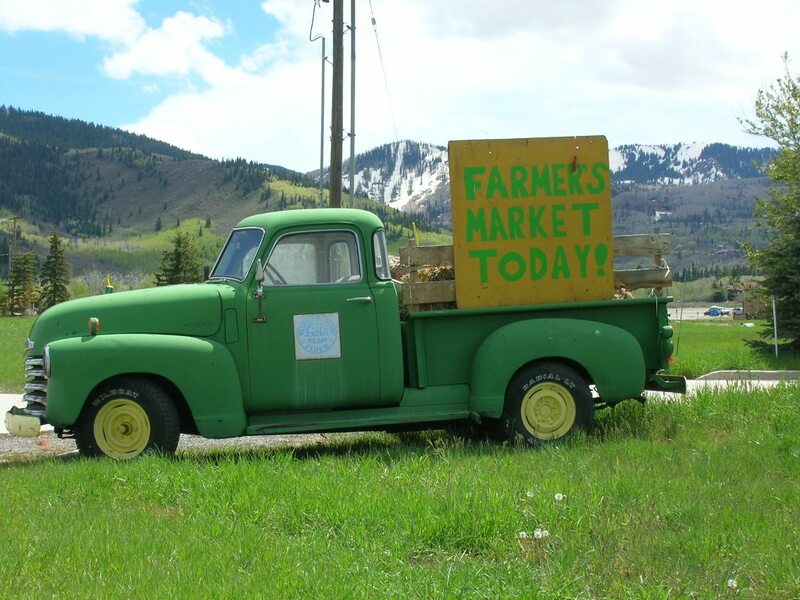 The Park City Farmers Market gives locals and visitors alike a sense that our community is not just about our resort amenities, Summit county not long ago was a mixture of mining and farming communities and to the east of park City, the farming still thrives. Local markets such as this one provide an easy way to be "green"...think global, buy local. If there is a Park City community amenity that you have questions about, drop The YouInParkCity.com Group an email. Posted in Park City Economy, Park City Real Estate Notes, Park City value | 0 Responses to "Park City Real Estate Value #4"
In the Glenwild subdivision - a 200 unit private development of custom luxury homes situated around Utah's best rated golf course - a showcase home finished and offered for sale in the middle of 2008 has seen price reductions of over $2M since its first offering. The price reductions and aggressive changes make for a nearly 40% off sale price. In the Deer Crest community of 144 homesites and the new St. Regis luxury hotel, the "Ski Magazine Dream Home" with its 6 bedrooms, 10 baths, 15 fireplaces, fantastic view and ski-in/ski-out location has actually seen its price rise by over $2M during the 3 years that it has been offered for sale. The Promontory golf club and resort second home community in Park City has after emerging from bankruptcy seen prices slashed in many cases by more than half of original asking price. Some homes in this area have been priced below their replacement or build costs in an effort to move them quickly. The new Dakota Mountain Lodge at The Canyons Resort is part of the Waldorf-Astoria collection of luxury hotels. The resort condominium hotel has been open just a few months and still has over 50 contracts still waiting to close (most all were written years ago during the height of the Park City real estate boom). One owner recently closed on their 4 bedroom 4 bath top floor model and immediately offered it for sale at $300K over the price they paid. The developers of the Silver Strike Lodge in the Empire Pass area of Deer Valley are auctioning 8 units of the development next month with opening bids set at approximately half of their original asking price. Approximately one third of the homes and condominiums that are complete in the Empire Pass area are currently offered for sale. Sellers in the Park City real estate market appear to have dramatically different ideas of current valuations. In the end, no matter what belief the Sellers have about the market, it is the Buyers that will set the value. Recent sales would appear to show that those Sellers willing to negotiate and/or aggressively reduce their prices are those that will sell their properties in our current market. For more information regarding Park City sales trends, home valuation opinions, and marketing alternatives contact a YouInParkCity.com real estate professional. Posted in buyers, Park City Economy, Park City Real Estate Notes, sellers | 0 Responses to "Park City Real Estate's Different Worlds"
I recently read a blog post by another Utah real estate agent discussing Buyers in her area that were putting in offers on property that were sure to be accepted by sellers (as they would be the highest priced offers) with the background idea that the property would later not appraise for the offer price and then the seller would lower the price to the appraisal value and settle on that as the selling price. It is an interesting type of bidding scheme and an idea that probably works well for short sales and bank owned properties in the current national real estate market where appraisers are bearing some of the blame for our financial crisis. Buyers using the offer high and hope to pay less' tactic are counting on the appraisal coming in lower than the offer price. This will mean that the Buyer can't get their expected loan or that they simply state that they are not willing to "overpay" for the home unless the price is lowered. Appraisers in Park City currently have a tough time with property appraisals not only because they are under increased scrutiny, but also because there are relatively few sales and therefore finding a comparable property that has sold recently can be tough. I have seen a few Park City real estate sales recently that were affected by low appraisals. The end result is not always a lower price. In one recent case, the seller did lower the sales price (although not to the appraised price). In another case of an appraisal lower than the agreed upon sales price, the seller just removed the property from the market; effectively stating that they would not sell for what the appraiser had established was market value. The Buyer did subsequently purchase the home at the original offer price. The Buyer's side tactic of offering over what the buyer wants to pay in hopes of an appraisal effectively lowering the price may or may not work in Park City. It is probably best left to investors that have no emotional attachment to the property they are buying. The YouInParkCity.com group suggests finding a property that you want based on location, features and local amenities. Present an offer that makes sense to you as a buyer. The appraisal may give you an idea of fair market value or it may not. Appraisers only have data as to other "similar" sales, but no two properties are alike. In the end, fair market value can be defined by a willing Seller and a willing Buyer. Posted in buyers, Park City Real Estate Notes, sellers | 0 Responses to "Pricing Schemes in Utah"
The end of September marks a shift in focus for Park City and Deer Valley real estate Buyers. Traditionally we see a shift away from single family residential homes and toward resort and ski property as the winter nears. This marks a good time to take a look back and compare the latest quarter real estate sales with past years. Park City real estate sales for the 3rd quarter 2009 show only a small drop in sales and unit volume versus the same period last year. Unit sales were effectively flat while dollar volume dropped by about 9%. -Note that for statistic purposes The YouInParkCity.com Group uses only sales in the 84060 and 84098 zip codes and only considers sales of single family homes, condominiums and vacant land- The 3rd quarter of 2008 is when sales in the Park City area started seeing the impacts of the economic downturn and people began to realize that we were not totally insulated from the national housing crisis. The downturn in dollar volume indicates that prices have receded slightly. Price corrections have varied greatly by neighborhood and the relatively small unit volume means that a few sales can have a large impact statistically. As a case in point, Dakota Mountain Lodge at The Canyons Resort sales represent over 10% of the dollar volume for this past quarter. Pricing in general is also showing downward pressure as the sold prices versus the list price was off by 8% while the list prices had shown an 8% discount already. Year to date sales versus the same period in 2008 show a decrease in dollar and unit volume of over 35%. The fact that the current period is flat may indicate that the downward market pressures have subsided and we are experiencing a bottom. There is a "feel" among most REALTORS® in town that business is getting better. Most agents are busy with many clients searching for values and beginning to write offers. To discuss more in depth statistics and analysis of the Park City and Deer Valley real estate markets, contact a YouInParkCity.com realty professional. Posted in buyers, Park City Economy, Park City Real Estate Notes, sellers | 0 Responses to "Park City Real Estate 3rd Q 2009 Sales"
I recently had someone walk into the office asking questions based on what seems to be the most common theme right now: "What is the best deal in town?" This gentleman then went on to tell me he'd be flying in from Texas to use the home or condominium and reiterated that he was looking for a bargain. I probed for some more background: Do you think you will be using it more in the summer or winter? Are you a skier, golfer, hiker, biker, fisherman, horseman, shopper? Will your family be coming with you? How many bedrooms would you like? Will you be renting it when you aren't using it yourself? Do you picture this as a retreat of sorts or an access point to recreation? Do you envision possibly living in the home full time at some point in the future? How familiar are you with the Park City area? Have you vacationed here in the past? Almost all of the responses were at best vague and ended with "I'm just looking for a good deal". I went on to try and explain that there are great values in just about every neighborhood within Park City. Pricing has retreated back to pre 2005 levels and inventories are high, there is no contesting the fact that we are in a Buyers market. "So what is the best deal in town under $1.5M?" the gentleman asked as he grabbed flyers ranging from a fractional interest condominium to a slope-side home to a horse ranch with 20+ acres and everything in between -asking "what about this area?" for each flyer. During the flyer barrage he mentioned a home he'd seen yesterday and that he was working with another REALTOR® and planning to write an offer - what did I think of X as an offer price (about 35% off the asking price for what most that have been in the home would consider a very well priced Park City home already)? I offered the same advice that I give to my own clients. Take some time and figure out how you will use the Park City or Deer Valley property you wish to purchase. Will it become home, a family vacation get-away, an income producing property, an investment flip or whatever? There are strong values and even some outright "steals" in our market, but many of the values should not be measured by a pure monetary value. What value can you put on the memories, lifestyle and pure enjoyment that owning Park City can bring? While the end result of your purchase in Park City may well prove to be a good investment financially when you decide to sell, the rewards you receive while you own here are truly the right reason to buy Park City real estate. Posted in buyers, Park City Golfing, Park City Real Estate Notes, Park City Skiing | 0 Responses to "Park City Real Estate"
The Park City real estate market place has been showing recent signs of increased activity. Most REALTORS® in Park City and Deer Valley will tell you they feel that things are getting better. Sales figures for the Park City Board of Realtors may or may not support this feeling. 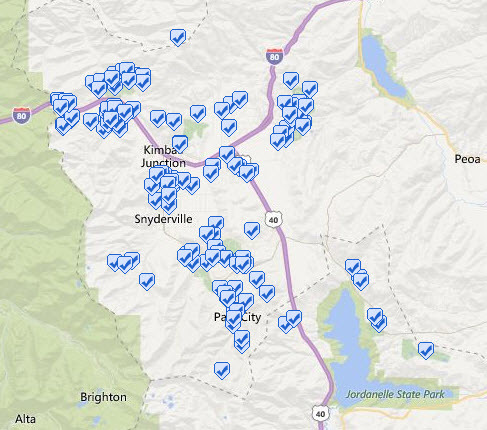 The month of July had 69 closings within Park City and approximately the same number outside the Park City zip code (Kamas and Heber Valleys). Park City area real estate sales totaled nearly $70M for the month while sales in areas outside of Park City (but through the PCBR) totaled about $12.5M. The sales figures represent an increase of approximately 50% over the same time last year. This quick glance will no doubt be the sound bite for the Board of Realtors. Upon closer inspection, the numbers remain strong, but maybe not quite as robust as they seem. Closings of recently completed construction account for $20M of the total -one closing of a newly built home in the Paintbrush subdivision of Empire Pass at Deer Valley accounted for over $11M of the total. 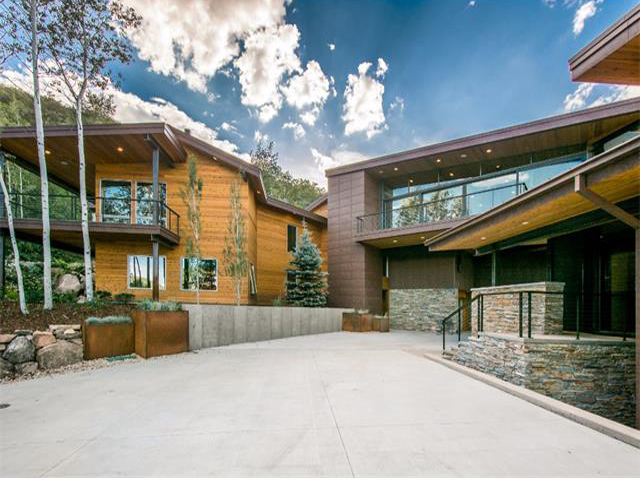 Closings at the newly completed Dakota Mountain Lodge at The Canyons Resort accounted for over $9M and should be even larger in the month of August. Without the new construction closings (most of which were put under contract in 2007), sales figures for July are not as strong. Yet the numbers are still larger that a year ago. Other positive market signals for Park City and Deer Valley are that sales have been dispersed through all portions of the market. Not everything that has sold has been distressed and lower priced home inventory. At least 10 of the real estate sales completed in July were for over $1M and were not distressed or new constructions including a $5M home in the Bald Eagle subdivision of Deer Valley. Outside Park City sales volume was up by 30% from last year with total dollar volume slightly down. This illustrates that there may be stronger deals in the outskirts of Park City. Outlying areas have definitely seen larger price variations. Overall, the Park City real estate market has shown an uptick for the last month, and pending sales for the last two weeks total over 50 potential sales. Buyers and Sellers in Park City and Deer Valley are finding common ground and making deals. Each neighborhood and subdivision is different as are the pressures on individual Buyers and Sellers to better understand if it is the right time for you to buy or sell Park City & Deer Valley real estate, contact your local YouInParkCity.com realty professional. .
Posted in buyers, Park City Economy, Park City Real Estate Notes, sellers | 0 Responses to "Park City Utah Real Estate Trending Upward (?)" Pricing trends in the Park City and Deer Valley real estate market are very interesting right now. As the national economy tries to find its bottom, Park City, Utah real estate is doing the same while making an effort to prop up its values. There has been an uptick in the sales activity recently and there is a feel within the real estate community that Buyers are coming back to the marketplace. Recent sales activity confirms the feeling. While the second quarter of 2009 shows 121 sales of land, homes and condominiums in the greater Park City area, there have been 75 closings in the last 30 days. There are some very interesting stories within the numbers here. A third of the sales were for over $1 million which goes against recent trends leaning toward "starter homes" and condominiums. Approximately 30% of the recent real estate sales in Park City and Deer Valley, Utah fall into a category of having drastically reduced prices (at least 20% from original asking price), being a distressed sale (short sales or bank owned properties), or a large variance to current asking prices for a local community. There is a definite trend toward value no matter what price level, and in the upper most price level there is a tendency to hide sales prices in an effort to keep neighborhood values up. The top 14 sales in this recent report show 5 sales at 20% or more off their original asking price and 6 sales reporting an undisclosed sales price. Utah is a non-disclosure state which means that the sales prices are not part of the necessary data for recording a sale and the sales price is not public record (this is one of the reasons that Zillow has such poor information for Utah). The MLS systems do report sales prices, but again, it is not public record. In an effort to keep data attached to a sale, an undisclosed sales price is recorded in the MLS as 95% of the list price at the time of the sale. The inordinate number of undisclosed sales prices at the top end of the market may artificially inflate the value of these areas, but it can be argued that it is better than no record at all. The number of undisclosed sales prices at the top combined with those sales showing a 20% price reduction (11 of 14 combined) shows that the top levels of the Park City and Deer Valley real estate markets are not immune to the market downturn and that the sellers in the luxury marketplace are also willing to make a deal. The increased number of real estate transactions in Deer Valley and Park City show that there are strong values in the market and that there are "value shoppers" finding deals here. Not all of these values have a listed price that reflects a value, but with some negotiation, bargains can be found. Contact a YouInParkCity.com real estate professional to claim yours. Posted in buyers, Park City Real Estate Notes, sellers | 0 Responses to "Park City Real Estate Value"
Mixed signals for the Park City and Deer Valley real estate markets. The Park Record, Park City Utah's local twice weekly news source, ran an article over the weekend titled "Optimism for Park City economy might be justified - Statewide economy expected to get worse this year". The title of the article seems to be in conflict with itself as much as most of the rest of the article. Within the article, there are quotes from the Park City Board of Realtors President stating that national indicators often drive the Park City real estate market and that the current trends in GDP and stock market have had positive effects on consumer confidence which will prompt many buyers to make the home purchase they've been contemplating for months.' This is a great positive spin for Park City and Deer Valley real estate. The article writer then reverses direction with the following statement: But the frozen credit markets are still hurting Park City's real estate market, he said. And the employment situation is still a concern because if someone has lost their job, or fears losing it, they're less likely to come to Park City for a vacation and/or think about purchasing a home here.' The Park Record then quotes another prominent local Park City real estate agent whose predictions are cautiously positive noting an incremental recovery locally and predictions for a national recovery in 2010. The newspaper and local real estate agent then go on to note that local tourism reports predict summer travel to mountain destinations to be down 15% from last year. And a six month forecast expecting occupancy to be down by 20% with room rates down by 10%. It seems that for every negative indicator there is a positive real estate note to go along with it and vice-versa. A look back at last winter can show that during the tough economic and political climate people still came out to ski and enjoy Park City. While they may not have bought local real estate, they did still come (albeit spending a bit less while they were here). I'm sure that soon local real estate agents will point to "pent up demand" from those people that didn't buy last year as the reason for optimism. Summer is here and this past weekend with its many markets, festivals, and celebrations showed Park City and Deer Valley in their best light. There's no doubt that many visitors had a thought that they should move to or buy a vacation home in Park City. Posted in Park City Economy, Park City Real Estate Notes | 0 Responses to "Mixed signals for the Park City and Deer Valley real estate markets." The Park Record Newspaper (Park City Utah's twice weekly news resource) ran an article this week stating that while construction costs should be enticing for building, builders and suppliers remain quiet. Park City home building costs have come down recently due to a lower lumber, asphalt, steel and concrete costs. Jim Drexinger, senior vice president of sourcing for Stock Building Supply, which has a large store near Kamas that supplies local builders, said global markets are affecting many of the products they sell. Some lumber products have seen a "significant" reduction in price and some to "multi-year historic lows," he said. Additionally, the slow building market has lead to a glut of construction laborers which has lead to very favorable labor costs for those people choosing to build. Unfortunately while costs are down (Jared Rakisits, president of the Park City Area Homebuilders Association was quoted as saying "It's probably the best time in quite a few years to build a house"), we are still dealing with a tight credit market and construction loans are not easy to obtain in Park City & Deer Valley (or most other spots in the country). Not all home construction costs have gone down in the Park City area. A local lighting retailer noted that prices in their field have been steadily rising at five to ten percent a year. This has some Park City and Deer Valley home builders trying to cut costs and search for cheaper materials. The lack of recent sales of vacant land in the Park City and Deer Valley are another indicator of the slow construction and building market. There are currently over 450 listings for vacant land in the greater Park City real estate area and there have been 9 sales over the past 3 months. Local Park City and Deer Valley builder Richard Jaffa of Jaffa Group Design/Build was quoted as saying While the recession may be over by next year, it will take about three years for the area's housing boom to fully recover.' Predicting the bottom of the Park City and Deer Valley real estate market is anybody's guess, but there is no doubt that the current high inventory levels coupled with low building costs make this an opportune time to purchase and build n Park City, Utah. As skiing film maker Warren Miller liked to say: If you don't do it now, you'll just be a year older when you do next year. Posted in buyers, Park City Economy, Park City Real Estate Notes | 0 Responses to "Construction in Park City Remains Slow"
On June 2, 2009 KSL.com News reported that short sales' are on the rise in Salt Lake City, UT. The report gives very few details and goes on to quote a few Realtors in Salt Lake City about the effects of short sales and whether or not they are good for a potential buyer. The overall report had very little information in terms of data, but it does note that 1 in 7 listings in Sandy, Utah (a suburb of Salt Lake City) is listed as a short sale. Information like this that goes out nationally (most of the news about Utah is delivered via Salt Lake City) gives people the idea that the news is applicable throughout the state including Park City and Deer Valley, Utah. Real estate is a very local commodity and it is impossible to make assumptions based on one neighborhood and imply that it is true across all neighborhoods. The number of short sales per active listing in the Park City area is less than one in 25. While there is a glut of homes on the market here in Park City, most homes are not a distressed sale. This is not to say that there are not any deals to be found in the Park City area. Many neighborhoods in the Park City real estate area are seeing prices of homes and condominiums fall by 20% off of their highs. There are also short sales in the Park City & Deer Valley real estate market, and they cover just about every price range including a short sale in the Colony at The Canyons Resort listed at $3.99M down to condominiums in the Kimball Junction area listed at $119K. Of the 50 or so short/distressed sale inventory in the Park City area, nine are listed at over $1M, and 20 are over $500K. Short sales are not the only way to purchase a property in Park City and Deer Valley at a bargain price, and the relatively few short sales in the area (1 in 25 versus 1 in 5 in Draper, UT) make them a longer and tougher process. Due to the fact that many owners in Park City have a lot of equity in their homes, the deal is often not a short sale, but just an owner taking a large loss. So when you are looking for a real estate deal in Park City, keep a focus on the end you are hoping for, whether it is a home to retire to, a weekend get-away, an investment or rental property. The deals are there, contact your YouInParkcity.com Keller Williams REALTOR® to find the one that is right for you. Posted in buyers, Park City Economy, Park City Real Estate Notes, sellers | 0 Responses to "Park City short sale update"
The Park City Board of Realtors welcomed speakers from the Rocky Mountain Resort Alliance (RMRA) at its monthly luncheon last week. The alliance is made up of the Boards of Realtors from destination ski towns in the western United States. The alliance includes Park City, Utah, Sun Valley, Idaho, Jackson Hole, Wyoming, Whistler, BC, Aspen, Vail, Steamboat Springs, Telluride, Summit County, and Winter Park, CO. Speakers were present from Lake Tahoe area of California as well as Vail, Co and Jackson Hole, WY. The real estate sales statistics for first quarter of 2009 were presented to the Park City Board attendees for each area in the Alliance. A quick look at the statistics gives an immediate sense of "misery loves company". Statistics across the board show sales figures being down from 50% to 75% along with falling median sales prices. There does not seem to be any area that is immune to the effects of the National and International economic downturns especially since it is combined with the current squeeze on credit markets. The interesting part of the meeting was the discussion that followed. It was noted by each of the speakers that there were bright spots and areas (price ranges) that are seeing activity. Much of the activity is in the lower and entry level end. Some areas also noted sales activity on the very high end of the market. Many of the "bright spots" in the current market may be attributed to the small sample size we are dealing with when looking at the latest quarter statistics. The speakers all seemed to agree that there are many "lookers" in the current market and that while many people are waiting for the bottom, there is a sense of pent-up demand. All of the resort towns in the Rocky Mountain Resort Alliance seemed to agree that it is a Buyers market and Park City real estate is right in step with the others. Increased inventories and few sales are leading to strong values in the secondary home and vacation markets. For more information; contact your YouinParkcity.com Keller Williams Park City Real estate Agent. Posted in buyers, Park City Economy, sellers | 0 Responses to "Rocky Mountain Resort Alliance Statistics"
The Park City Board of REALTORS® last week released statistics for the year ending December 31, 2008. The February press release shows that sales in the Park City, Utah area were down by nearly 50% in dollar volume versus 2007. The sales dollar volume at just over $1 billion was roughly equal to the sales of 2004. Looking at the sales a little closer and narrowing the scope of the statistics to only include Park City (not outlying areas such as Kamas, Francis, Heber and Midway) and focusing on sales by property type and unit volume, the statistics show that: single family home sales were down by 43%, condominium sales were down 41%, and leading the fall was vacant land sales which fell by 75% in unit volume. Local REALTORS® are quick to note that median sales prices have only fallen slightly and that Park City and Deer Valley fundamentals remain strong. The president of the Park City Board of REALTORS® was quoted as saying: "People buy homes in Park City because it is based on a lifestyle choice. Our market has never been primarily driven by speculation and investment our product is very diverse and buyers have a wide range of properties that fit their needs and budget. Park City's world class resort facilities and year-round recreation opportunities will continue to make our community an attractive choice for many buyers." While this may be true, there is no denying that our market is affected by what goes on in the rest of the country and the rest of the world. The Park City and Deer Valley real estate markets have many opportunities and choices for buyers; something that wasn't true while the market was soaring. Vacant lot sales indicate that home building is down (Park City building department permits concur) and will be for the near term. There are a number of very high-end properties due to open in the near future including the St. Regis Deer Crest Resort, Montage Resort at Deer Valley and Dakota Mountain Lodge which is being serviced by the Waldorf Astoria and includes the Golden Door Spa. The impact of these resorts and the associated real estate sales will be felt in the next two years. Sales of new construction condominiums played a major part in Deer Valley sales in 2007 with over half of the 180 condominiums that sold being newly built. Sales of condominiums in Upper and Lower Deer Valley combined with Deer Crest and Empire pass were down 67% in 2008, but there were far fewer new condominiums available. Real Estate numbers nationwide show slow sales and many point to the fact that we still have sales in the Park City area as a good sign. To discuss how these sales numbers affect you and your decision of whether or not to buy or sell realty in the Park City and Deer Valley, Utah area call or email your http://www.youinparkcity.com/ Keller Williams Park City Real Estate agent today. Posted in buyers, Park City Economy, Park City Real Estate Notes, sellers | 0 Responses to "Park City, Utah Real Estates Sales Statistics 2008"
The national and global economies have affected the Park City real estate market. We know that at our market peak, Buyers were coming to Park City to buy second homes and vacation property from all over the world. Loose lending standards made finding the money for a second home easy. Housing prices rose everywhere. Higher property values wherever the Buyer's home happened to be made for great equity to borrow against for the purchase vacation property. We know that all this has come to an end with the bursting of the housing bubble. Short sales and foreclosures are now a staple story item for the nightly news. Many boom cities have seen home values drop by 40% or more. Stories abound about the ability to purchase bank owned and distressed properties for truly pennies on the dollar compared to what they sold for just two years ago. In Park City, we're often asked by visitors where the deals are here. A recent look at the Park City area Board of REALTORS® multiple listing service showed 1871 active listings (653 single family homes, 798 condominiums and 420 parcels of vacant land). Of these, only 26 were listed as a short sale, bank owned or in foreclosure. That is less than 1½ percent of the total number for sale. National figures while the real estate market was booming put the "normal" foreclosure rate at around 3%. Does this mean that Park City has somehow not been affected by the national and global economic changes? No. Park City and Deer Valley real estate have been impacted by the global economic changes, just not to the extent of Las Vegas, Miami, Phoenix and Southern California. The scarcity of land along with tough hillside builds and tight city regulations have meant that the housing boom did not leave Park City overbuilt. Changes in the market have occurred and prices have fallen from their peaks, but there appears to have not been the speculation and dependence on property appreciation to fund loans here that has lead to the demise of markets in other areas. The local economy in the Park City and Deer Valley area is only beginning to feel the pinch of the national and global economic downturn. I cannot remember previously seeing signs on Main St stating that restaurants are not hiring. A look through the local paper shows few job opportunities (in a "normal" winter, service and tourism industry jobs are abundant). We are starting to experience job losses. It is possible that the downturn may be just beginning here. Or it is possible that the effects of current low interest rates and the push for new jobs on a national level will turn everything around quickly and all our market will see is just a slight downturn. Only time will tell. All real estate is local. Are there deals to be found in Park City, Utah? Absolutely. Are there short sales, bank owned and distressed properties? Yes. Will you be able to find 5 homes in a row all in some state of foreclosure and buy them all up for a price that previously would buy one? No. Have the fundamentals of what makes Park City and Deer Valley a desirable place to live or vacation changed? Not at all! For more information on Buying or Selling homes, condominiums and land in the Park City and Deer Valley Utah area contact the YouInParkCity.com Group. Posted in buyers, Park City Economy | 0 Responses to "Park City Short Sales"